A battery charge cycle describes the voltage and current relationship in a battery as the charger returns the energy capacity to the battery. Different battery chemistries, such as lead acid, Ni-Cad, etc. require different methods of charging. 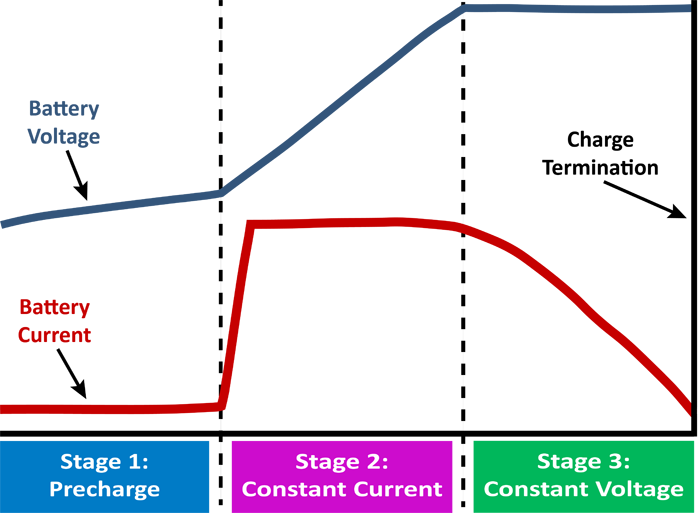 The two charging cycles described below, the maintenance charging cycle and the three state charging cycle, are for lead-acid batteries. Maintenance type chargers are useful in applications such as battery storage and where there is no requirement to return 100% of the battery capacity by the maintainer. The Chargetek 150 is a maintenance charger. Maintenance type chargers are useful in applications such as battery storage and where there is no requirement to return 100% of the battery capacity by the maintainer. Maintenance chargers are often used where the primary charging source, such as an alternator, is used infrequently. The battery charge is maintained over the long term by the maintenance charger. Please refer to the figure below. The Float mode follows the constant current mode. Float mode is where the battery voltage is maintained at approximately 2.25 volts per cell, or 13.5 volts for a 12V battery. This charger will maintain the battery indefinItely without boiling out electrolyte or overcharging the battery. Three stage charging is the method most lead acid battery manufacturers recommend as the best and most efficient way to return full capacity to the battery and extend battery life. All Chargetek lead acid chargers except the CT150 (which is a maintenance charger) are three stage chargers and return full capacity. Please refer to the figure below. 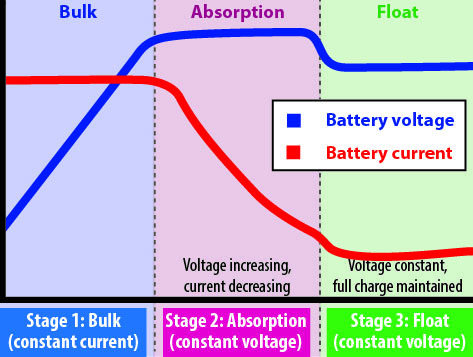 Four stage charging supplies constant current to battery until absorption voltage is reached (VFSTERM). Transition to absorption mode follows and regulates battery voltage at VFSTERM until current decreases to IABTERM. 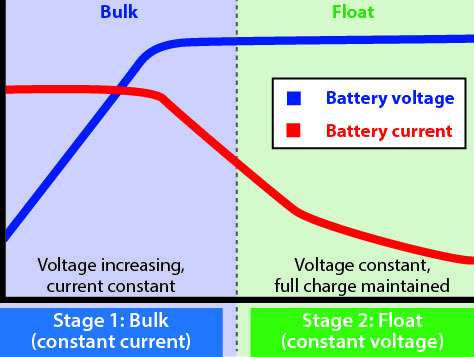 Float mode follows and regulates battery voltage at VFL. At the user's discretion, an equalization mode can be initiated. The purpose of the equalization mode is to remove the sulfation from the lead plates and to eliminate the stratification of the electrolyte. Approximately 2.5-2.6 volts per cell is applied to the battery with the charging current set to a very low value, typically less than 0.5 amp. The equalization mode may last anywhere from a few hours to over 24 hours depending upon circumstances. For more information about equalization and desulfation, see this presentation. 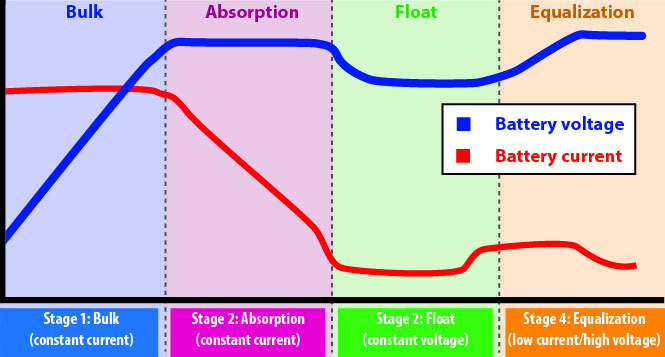 A three stage charge routine which is recommended by lithium-ion and LiPO battery manufacturers is described below. Stage 1: Precharge. If the battery is deeply discharged, a precharge of approximately 300mA is applied until the voltage is 2.8 volts/cell. Stage 2: Constant current mode. The charger provides constant current until the battery voltage is Vtpf volts/cell.